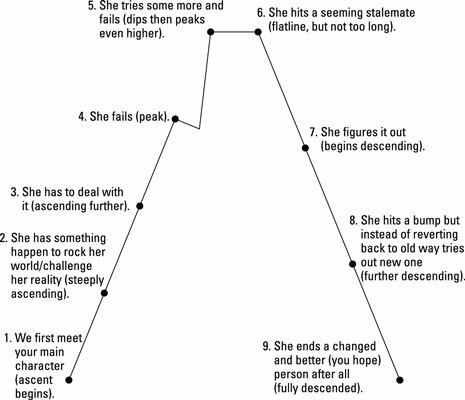 A character arc is just a simple visual tool to help you chart out your children’s book character’s development. Her driving desire must be made clear from the start. The changes your main character makes in her life can be drawn into this arc so you can see how she drives the action as the story starts, then something occurs that requires action, then her plight reaches a climax, and finally she heads toward resolution. When we first meet your main character her driving desire is made clear (ascent begins), she has something happen to rock her world/challenge her reality (steeply ascending), she has to deal with it (ascending further), she fails (peak), she tries some more and fails (dips then peaks even further), she hits a seeming stalemate (flatline, but not for too long), she figures it out (begins descending), she hits a bump but instead of reverting back to old solution(s) tries out new one (further descending), and she ends a changed and ideally better person after all (fully descended). Cinderella is a happy, well-adjusted girl living a privileged life when her father remarries and brings a stepmother and two sisters into her life — all three of whom detest her. Show Cinderella as sweet and trying to cope, a girl who is confused but still has her father watching her back. Make clear her desire to be considered an equal and equally beloved member of the family. Cinderella’s father dies, leaving the poor girl at the mercy of the merciless stepmother and stepsisters, a veritable black sheep. Cinderella tries to stay her course, but fails to move these women whose abuse of her escalates. Cinderella still uses her same old way of coping (being sweet and working hard to avoid the reality of her situation), but the abuse gets worse. Cinderella fails to stand up for herself, and she ends up a scullery maid in her own home. Time for a change, but is she strong enough? Cinderella and everyone else in the household are all excited over the upcoming ball and is getting ready to attend. Cinderella again resolves to put a happy face on her situation, but she is thwarted and is unable to attend the ball. The fairy godmother helps her attend the ball. Cinderella rises to the occasion, dazzling all attendees, including the prince, but has to run out of the ball at the last minute, leaving a slipper. So she’s back to where she started: in rags, with no prospects. Cinderella decides that she is going to get a chance to try on that slipper no matter what her stepsisters, who may suspect her involvement with the prince, say or do. Cinderella gets locked in the cellar when the prince arrives, but instead of accepting her fate with a smile and cleaning even harder, Cinderella alters her driving desire, gets wise, and fashions a way to break out in time. Eventually, she gets hitched — thus fulfilling her desire to be loved, but creating a chosen family instead of the stinky one she inherited. Wiser and back to her old position and privilege, readers have to see how she uses her power. Although she could have her stepmother and stepsisters thrown into a dungeon from where they would never ascend (or worse), Cinderella opts to take the higher road and allows them to live. A character arc is just a fancy way of making sure your character has grown and changed throughout the course of the story.